Generation Z is barely a blip on the radar if you’re still trying to figure out what to build for Millennials. But don’t ignore this generation—the oldest are renting now and will be purchasing homes sooner than you think. While much is still unknown about their housing preferences, it’s not premature to start brainstorming designs for Gen Z. The oldest, now in their early 20s, are graduating from college, pursuing careers, and either renting apartments in multifamily buildings or sharing houses with roommates. They could start buying homes in as few as five years. 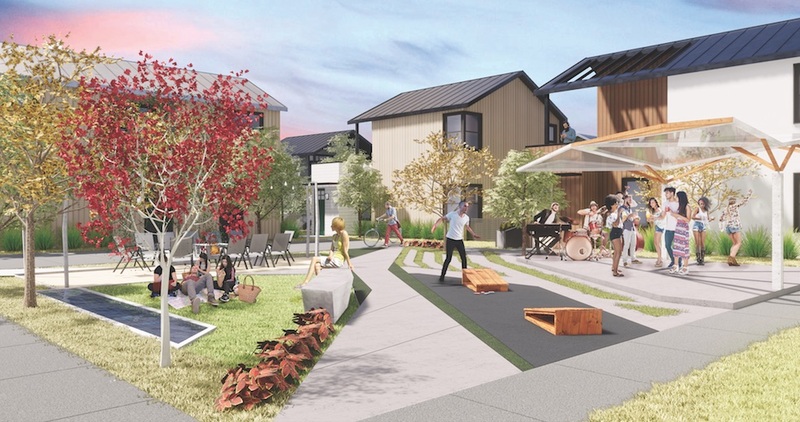 Bobby Long, principal and design director for Kephart Community:Planning:Architecture, in Denver, says recent trends suggest Gen Z is looking for alternatives to the traditional college experience, if not entering the workforce directly from high school. The alternatives include online education, commuter colleges, trade schools, and after-school jobs. “As such, more and more are looking for housing at a much earlier age than the Millennials,” Long says. Gen Zs are true digital natives who don’t remember life before smartphones, apps, and social media. They’re more fiscally conservative than Millennials, having grown up at a time when their parents were losing money in the market crash and struggling with six-figure college debt. In a 2017 Gen-Z study by the Center for Generational Kinetics, one out of five respondents said personal debt should be avoided at all costs, and 12 percent of respondents ages 14 to 21 have already started saving for retirement. The Center, in fact, calls them the Throwback Generation because of their traditional values. Thirty-eight percent plan to work while attending college and 24 percent intend to pay for college through personal savings. Clearly, this is a generation poised to become homeowners. Research compiled on their lifestyles and attitudes, along with design trends in student and multifamily rental housing, offers clues as to what homes for Generation Z may look like. Older Gen Zers are projected to spend $226,000 in rent during their lifetime, according to analysis by rental housing and real estate search engine HotPads. That’s about $24,000 more than Millennials and $77,000 more than Boomers. But the study also shows that Gen Zers will rent for a slightly shorter period of time than the other two generations before buying and will probably benefit from a stronger job market than Millennials. Gen Zers and Millennials prefer different social media outlets. In 2015, Vision Critical Communications, a customer relationship intelligence software provider, reported that the most-used device by Gen Z is a smartphone, while Millennials prefer a desktop computer. Gen Zers watch less TV than Boomers or Gen Xers; prefer Snapchat and Instagram to Facebook, Twitter, and LinkedIn; and spend massive amounts of time texting. “They’re big gamers and big dreamers,” says builder/developer Stephen Adams, owner of Adams Craig Acquisitions, in Scottsdale, Ariz. “They’re a reality-TV generation, even more so than the Millennials. They like music and video and other things that are cool and fun.” Gen Zers are more entrepreneurial and likely to work from home, says Dan Swift, president, CEO, and chairman of architecture firm BSB Design, in Des Moines, Iowa. They’re not as fixated as Millennials on getting a college degree because jobs that don’t require one are available at companies like Apple and Google, he says. Co-living, or cohousing, may not appeal as much to privacy-loving Gen Zers as it does to Millennials, Swift says. As living spaces get smaller, features such as robotic walls will become more prevalent. These movable walls transform space, he says. For the ultimate in space efficiency, the smallest units might have kitchen cabinets and entire kitchen modules that drop from the ceiling, and dining room tables that come up from the floor allowing you to change spaces on the fly, says Chris Texter, a principal at KTGY Architecture + Planning, in Irvine, Calif. Texter thinks most Gen Zers would be willing to share a common living area but want their own bedroom suites so they have a private place to retreat to. Similar to student housing, a Gen-Z “pad” might have multiple bedrooms surrounding common living areas. Kitchens could change in the near future, with a single oven that does microwaving, baking, and induction heating and has just one or two burners. “Gen Z wants to cook for the experience, not necessarily every night,” Texter says. Spaces other than a living room or bedroom will be specifically set up for working from home. There could be a business center with a Starbucks-type atmosphere where Gen Zers can work in proximity to others and hold small meetings if necessary. Cutting-edge home technology is an absolute must, says John Missell, education practice director for CR Architecture + Design, in Cincinnati. “Elements such as lightning-fast Internet and clear wireless reception will become inherent expectations,” he says. 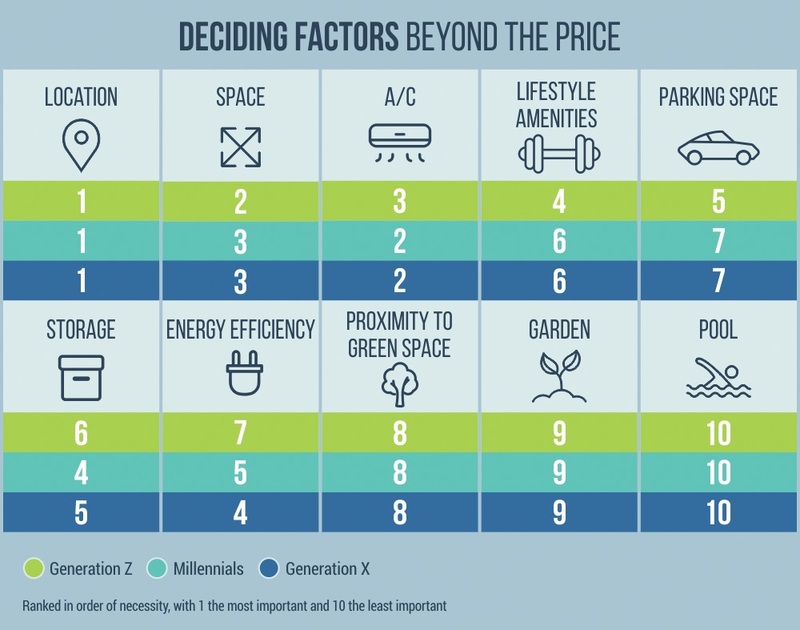 Missell believes the desire for affordability, durability, minimal maintenance, and maximum environmental comfort will be as relevant to Gen Z as it is to Millennials. “This can be seen through Generation-Z students’ emphasis on community and expectations for expanded amenities in the living environment,” he says. Research shows multifamily is still a strong investment, driven by Millennials’ and Gen Z’s need for affordable rental units. According to the latest “Emerging Trends in Real Estate–U.S. and Canada” report from professional services firm PwC U.S. and the Urban Land Institute think tank, this demand is an opportunity for builders to scale product to the preferences of younger generations—specifically, affordable starter homes, townhomes, and condos that are smaller and more energy efficient. One example is an 18-unit apartment building in downtown Tempe, Ariz., three public-transit stops from Arizona State University. Arizona builder Adams Craig expects to start leasing by late August 2019, says owner Stephen Adams. “It’s for kids just out of college and people who work at or around the university,” he explains. “I don’t expect it to be student housing.” Adams anticipates that renters will be young professionals ages 23 to 28 and will include families as well as singles and couples. With such features as solar panels and on-site rainwater harvesting, residents of the net zero building won’t have to pay for water or electricity, helping keep rents lower. The two- and three-bedroom apartments average 1,240 square feet (1,500 including decks). Each unit has a home automation system that’s controlled by residents using a mobile device. Nathanael Maki, residential director of Perlman Architects of Arizona, in Phoenix, says the project was designed with internalized parking to create a stronger presence along the site’s perimeter. There is bicycle storage space in the first-floor entry areas so second-floor residents can bring their bikes indoors but avoid having to carry them upstairs. The need for smaller, less expensive homes will be even more acute for Gen Z than it is for Millennials. Demographers believe that Gen Zers will continue the trend of having smaller families and won’t stretch to buy a home they can’t afford. This is where factory-built housing and components could play a big part, Adams says. From modular and panelized construction to shipping containers, designers and builders must do “anything they can to cut cycle time from 86 days down to 60 or 70,” Adams says. Several KTGY clients have expressed interest in the off-site construction of detached homes in the 500-to-1,100-square-foot range. Although high land costs will continue to be a barrier in some markets, “It’s being done with rentals right now, and for-sale housing will follow,” Texter says. Another key difference between Gen Z and Millennials is that Gen Z isn’t as enamored of the urban lifestyle, says Kephart’s Bobby Long, who expects Gen Z to skip over the experience of city living and settle down in the suburbs, where home prices are lower. Ironically, the suburban communities most desirable to Generation Z are those that cultivate an urban feel. • The U.S. Census Bureau defines Generation Z as those born between 1997 and 2010. • By 2020, Gen Zers will outnumber Millennials by nearly 1 million, according to Zillow. • The Pew Research Center estimates that Gen Z is about 70 million strong and will start buying homes within five to 10 years. • Some are even buying houses now. The credit agency TransUnion reports that approximately 100,000 Gen Zers have mortgages, with an average balance of $140,000. The R+D Studio at KTGY Architecture + Planning, in Irvine, Calif., has generated conceptual designs for mini and micro homes that appeal to a wide range of renters and buyers, including Generation Z.
Micro homes are available as single-family detached, duplexes, and triplexes with oversize one-car garages. The triplexes get up to 25 units to the acre, says KTGY’s Nick Lehnert, executive director of design strategies. For the minis, KTGY identified a universal cluster size that accommodates a variety of product configurations and density yield. Called Block-150, it’s a 150-by-150-foot block, or pod, of nine two-story detached homes. The homes range from 754 to 1,316 square feet and one to three bedrooms. By reconfiguring the second floor, two of the six plans can expand to suit buyer needs for bedroom count and square footage. Each home has access to a private yard, a shared courtyard, and an optional attached or nearby one-car garage. Vertical green walls increase privacy for adjacent yards. Lehnert says Block-150 achieves an overall density of 18 units to the acre. 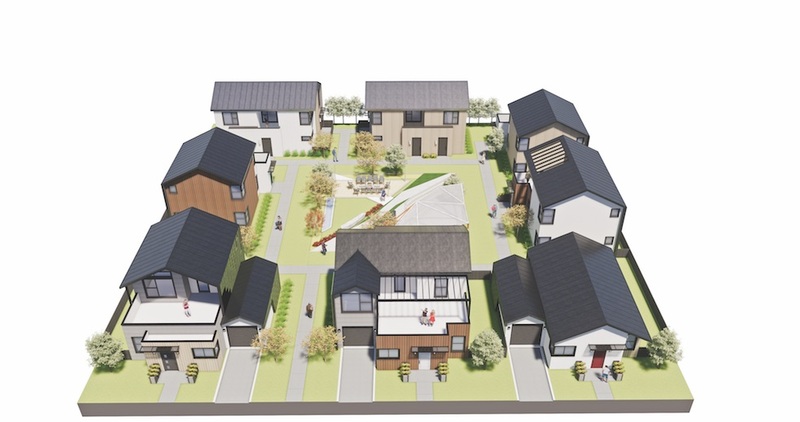 That density can be pushed to 20 dwelling units per acre by connecting another cluster.